Last week, if you follow me on Facebook and Twitter you know that I began my Weight Watchers membership. It’s only been one week using the Simple Start Program and I actually been having a great time using their super cool iPhone app. It takes all the guess work out of what to eat, making meal planning super simple. It even adds up the points for you, which means no need to waste time measuring or weighing out every little piece of crumb you eat. This week’s trip to the grocery store was a breeze with my new Weight Watchers app. I had no clue that fruits and veggies were ZERO points. Yay! As you can imagine my cart was filled with fruits and veggies, especially bananas which are my favorite! And speaking of bananas, I thought I would share with you one of my favorite healthier desserts to satisfy my late night sweet tooth. Instead of indulging in a delicious Twix Cupcake or Cake Batter Funfetti Bars, I used bananas to make an ice cream sundae. That’s right, an ice cream sundae! With fruits and veggies being ZERO points, I made an ice cream sundae using frozen bananas, yes BANANAS! The ones that are sitting on your counter with all those brown spots that your about to throw away. 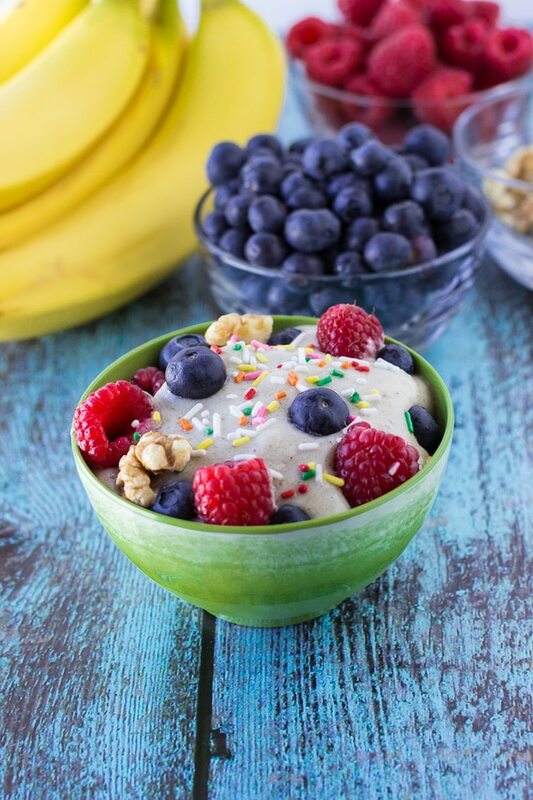 Well those banana make the BEST fat-free, gluten-free, vegan, dairy-free, ice cream sundae! Today’s recipe is simple all you need is over-ripe bananas, peel them and put them in the freezer until frozen, then using a food processor, process the frozen bananas until smooth and creamy. No sugar or cream added. 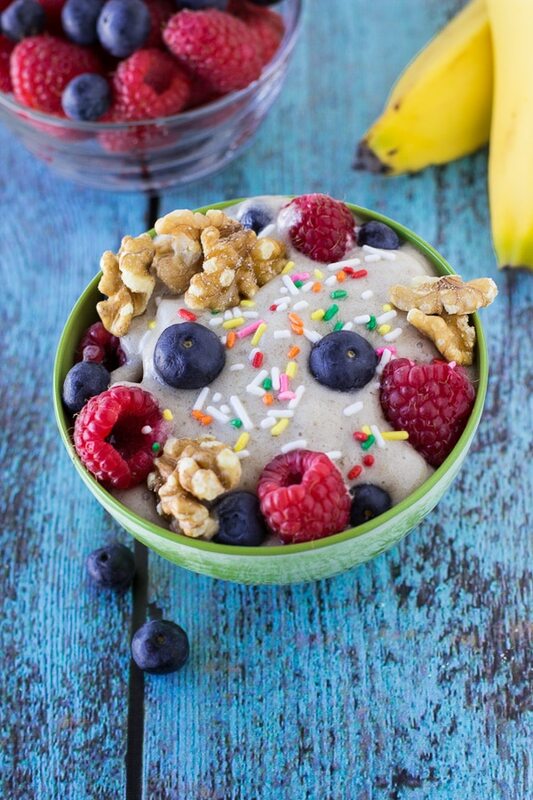 Just healthy frozen, soft serve banana ice cream. Delicious! 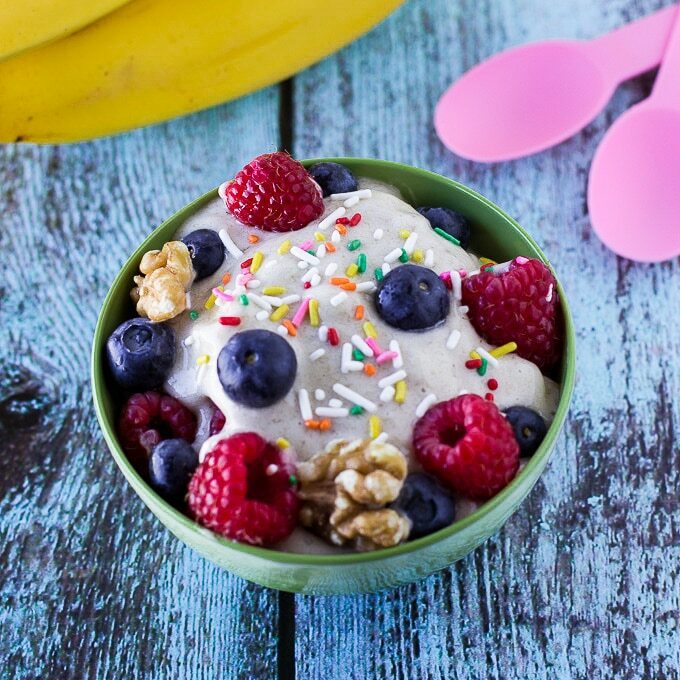 Super easy and fun to make, and the possible toppings are endless but my favorite so far is a couple of chopped walnuts, fresh berries and it’s wouldn’t be a sundae without SPRINKLES! I just started the Weight Watchers Simple Start program, but am already SO excited about making these simple changes for a healthier and happier me. 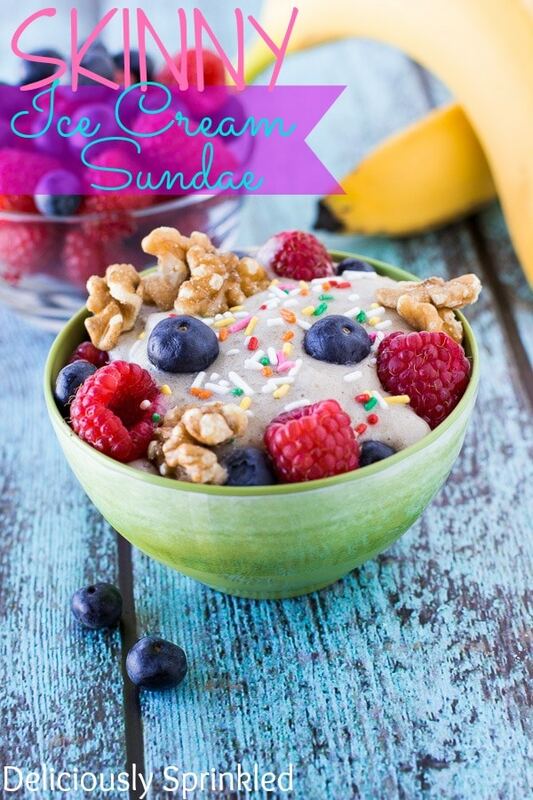 I love that I can still enjoy the things I love to eat…like ice cream sundaes but with a healthier twist! Peel bananas and place in freezer until frozen. When the bananas are frozen, using a food processor, process frozen bananas until smooth. Enjoy alone, or with your favorite topping. I dont have a food processor. Will a blender work for this? To make chocolate-banana ice cream just sprinkle your frozen banana pieces with unsweetened cocoa powder before blending. (Let sit for a few minutes.) OR….add a tablespoon of no calorie chocolate syrup (I use Walden Farms). You can also add frozen strawberries to the bananas — voila, another flavor. Enjoy!! Oh my kids love ice cream but I limit it. I love this healthier version. Thanks for sharing. Wow! That looks and sounds really good! I have a few bananas that are about to be over-ripe, going to have to try this! That looks delicious. I love sweet healthy ideas and this one looks delicious. My girls will love it. Oh my.. I must try this! What a great WW treat! And your photos are stunning! Love it! Love all the fruit! My daughter loves to toss it into a blender with yogurt and make smoothies! Congrats on your Weight Watchers Simple Plan journey! Wait! WHAAAAT? Why have I not known about this awesome alternative to ice cream before!? I am so making this for my girls tomorrow! You’re doing awesome on the program! It’s so good, your girls are going to love it! Just pinned your recipe. I’m loving the simplicity of Simple Start, too! No counting, measuring and weighing — and I’m still losing weight. Simple Start, where have you been all my life? 🙂 Good luck with your plan! What a great idea! I love that SImple Start is so user friendly too! Loving all of the posts. Pinning! That looks delicious! I love the addition of fruit and nuts, great combo! I love all the flavor elements in this, it would for sure cure any craving I had! I love this not only because it looks good, but I can get the kids to eat healthy too because they get to enjoy a treat and fruit at the same time! I love banana ice cream! I really don’t swap it enough for regular ice cream. Me either, but I will be swapping it out a lot more because it’s so delicious! Yum! The fruit is just what sets this over the top, but I also love the walnuts. I am just a little nuts for walnuts. This is so awesome I had to Pin it! Great, healthy and FUN idea! I seriously want one of these RIGHT NOW! That looks ah-mazing! Thanks, Ashley! Frozen bananas make the BEST ice cream, it’s so delicious! That looks great. If only chocolate and peanut butter were zero points. Can you imagine the combination of bananas with those two? I would be in hog heaven!